Ready/Set/Feedback -- Thank you for PROMPT testing as I need to get this build to Apple tomorrow (Friday). Most likely 1 or 2 will occur the reason being is the database vendor changed a setting on how dates are stored/retrieved from the database. If you have any problems DELETE and then REINSTALL this build. Without further boredom, please install this build and test FAST and THOROUGH as I will ask Apple tomorrow for an expedited review so we can go back on the air. I still have a few more tweaks to do tonight and may push another build to you so you can stay up to date. No new features (diedrich) - just bug fixes. Please provide all feedback in the Logbook Pro iOS Beta Forum . If you do not see this forum at The Forums then you do not have access, email me at beta@nc-software.com with your forum username and I'll grant you access. Synced completed flights. Had 5 incomplete days pending (upcoming trip). Installed. Main screen says there are 5 flights but there are no unsynced flights when launching the Flights screen. I assume they were deleted as you mentioned they might. Bad news... I just added a new flight (trying to recreate my next trip tomorrow) and the trip will not display. I go back to the home screen and it says there are now 6 flights. To clarify, you can't tap a blank row either, the day/flight simply isn't there. I had 6 previously imported flights when I installed new beta build. I now have the same issue as diedrichg. Badge App icon shows a 6 but they are not visible in the app. To add on, I made up a flight and set it as pending. Badge app counter increases to 7 but it's still invisible in the app. Go to the Contact Us area and send me a bug report but I expect that anyone that installed 5.9.18/19/20 will need to delete the app and reinstall and start fresh to clear this database configuration issue. After sending your problem report please delete and reinstall then let me know how things work from there. Sent a report. Uninstalled. Reinstalled. Created a pending flight. It shows in the list. Closed out the app, not just suspend. Restarted and all is well. Thanks Diedrich, your bug report 100% confirms the issue. I'll be able to do my final tweaks and most likely get this build out to Apple tonight. 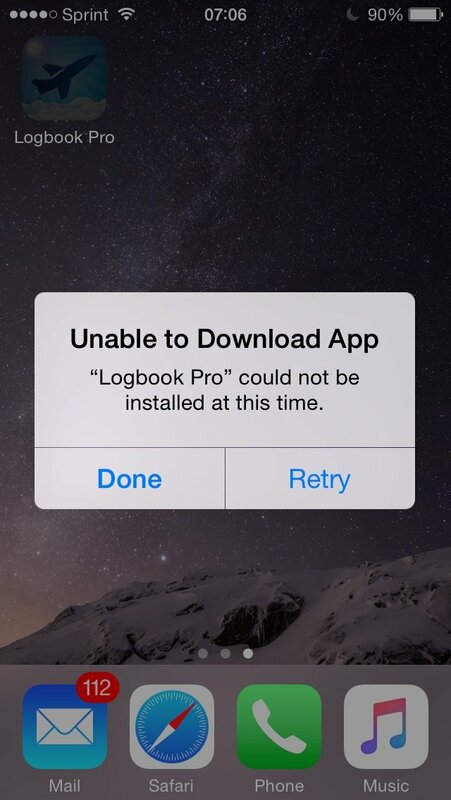 ALL using 5.9.18/19/20 please DELETE and REINSTALL Logbook Pro Mobile. The latest is 5.9.22 from HockeyApp and is all fixed up - delete and reinstall this version and you should be good to go. I'll push you a custom build shortly so you can install on your iPhone. It was not in Apple. New build is ready for you, go to HockeyApp or check your inbox for 5.9.22.1. [just keeping up with newest and latest.. and unbroken.. He's also a little behind on emails too!